Every chord change in the blues should be viewed as an opportunity to create harmonic movement and interest for the listener. 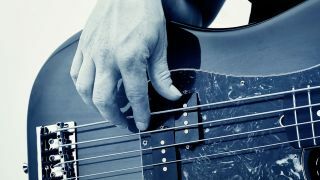 This tutorial takes a look at five different approaches to playing walking basslines in a 12-bar blues progression. There are many different incarnations of the standard 12-bar blues, but before venturing into new territory it’s worth learning the standard format. The first chord chart below shows the most common 12-bar blues in the key of A. Typically of blues, the chords are dominant 7ths (A7, D7, etc), so the root, 3rd, 5th and b7th intervals of the chords can form the larger part of any bassline played over the progression. Your next step is to move on from a chord interval-only bassline to a walking bassline, and the concept is fairly simple: each new chord should be approached from a semitone above or below the root note before landing on the all-important root bang on the change. Adhere to this basic rule and you can even tackle the approach notes in a similar fashion, creating the effect of ‘walking’ to the new chord in one-fret steps. This is the most common 12-bar blues form (aka I-IV-V progression). Play through the progression using only root notes if it is new to you. A few extra chord changes and, in particular, minor chords distinguish this jazzier take on the 12-bar blues from the basic form. Each new chord is accompanied by a crucial root note on the bass. Bar 1 follows the root with a major 3rd, followed by chromatic steps up to the chord change. Here the bass moves from root to the 3rd and 5th, before walking chromatically into the change. Notice how you approach the change from above this time. This line combines phrases from the previous examples to stay on A7 for two bars. The open strings are passing notes, and are more for emphasis. A full A7 arpeggio is used here including a rock ’n’ roll 6th interval. The final note suggests a move to D7, but you could easily change the vital approach notes. The full four-bar turnaround includes a more complex chord sequence. The first two bars outline the root, 3rd and 5th of each chord, approaching the changes using the ‘semitone above’ trick. Although the changes in bars 3-4 are quite quick, it simply uses root then semitone above approach. You could also use the semitone below approach.